"From a vantage point 'above the sea', it seems you can see forever." Artist comment: "This is a 'C' composition incorporating clouds and headland rocks into a pleasing design. Onto a substrate of tung wood which had been treated with gesso, I sketched with oil the important design elements keeping the basic light and dark areas in balance and harmony. I chose the colors I wanted to use to create a specific mood. Then, beginning at the top of the 'canvas', I painted sky, sea, and the small strip of beach. Employing a dark value for the foreground brought it 'forward' creating depth and distance." 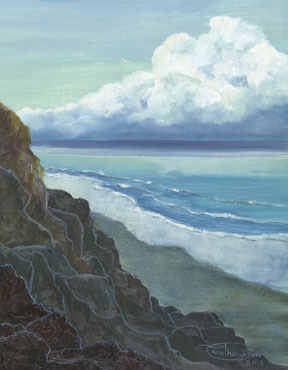 "Above The Sea" is a limited edition, giclée print from an original oil painting by Carol Thompson. The edition includes 3600 authorized, signed, limited edition prints (3500 numbered and 100 artist proofs). Release date is November 2015. Image size and substrates vary. All prints are signed and numbered by the artist and include a certificate of authenticity. Paper prints are shrink wrapped on foam board. Canvas prints are coated with a protective spray.